Note: This is the second part of the Free to Play Journeyman Guide Series. Be sure to check out Part 1 first! Deck building guide: Organic development from all-basic decks through to competitive decks week-by-week. 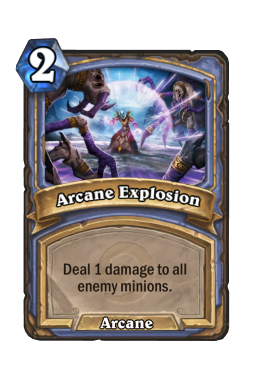 Deck building restrictions: I'm not going to use any awesome powers of Arena play or raw luck in opening Legendary minions to my advantage - I will keep it simple so you can follow along, regardless of your ability or the strength of your collection. 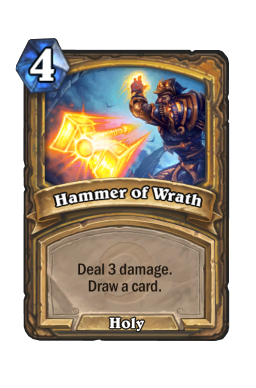 The scenario described in the foreword above is not unusual when your deck comprises common and basic cards and you're going toe-to-toe with the currently popular decks such as Patron Warrior, Mech Mage, and Combo Druid. 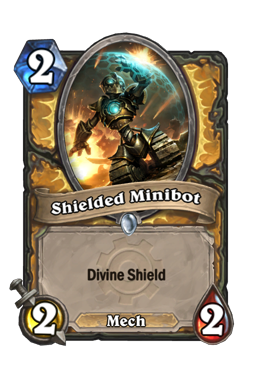 Perhaps not every opponent has the perfect list, but they're packing the deck core; the multitude of Mechs and Goblin Blastmage , the pingers and Patrons, the Ancients and Force of Nature . But not us. We don't roll like that! 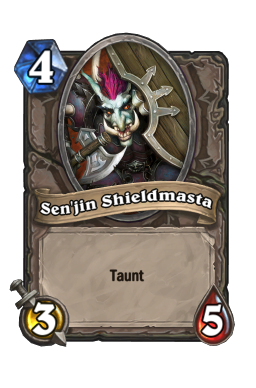 Too cool for school, we're all about playing Chillwind Yeti , Sen'jin Shieldmasta , and Shattered Sun Cleric in each and every deck, yo! 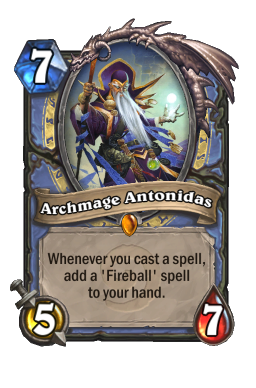 Every win with these cards is etched into memory: "He played Archmage Antonidas but I won anyway!" A win against the odds is the sweetest nectar, the adrenaline kick that keeps idle minds from the streets; a moment of personal glory. But you have to pick your poison. 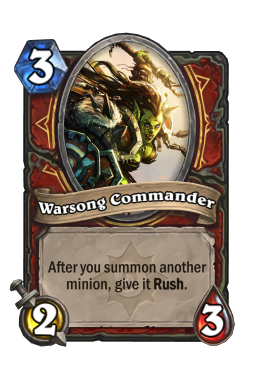 Even with limited cards there are some we should not omit the moment we get a seemingly better card. Anyone can remove a Bloodfen Raptor for a Faerie Dragon . 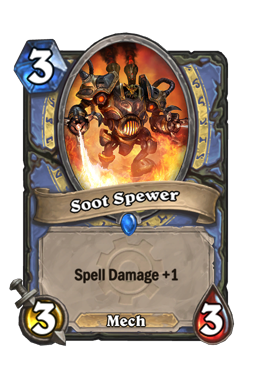 Even a six-year-old will tell you, "Uncle, that card has more words on it; you should use it instead!" or even "It's a Dragon - it must be the best card ever!" 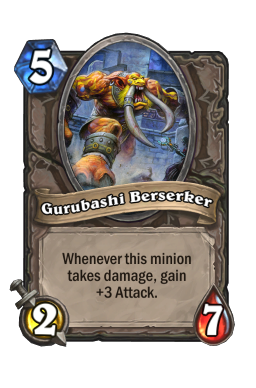 But other cards cannot be judged purely on being part of the Basic Set. 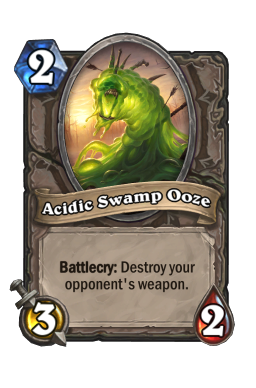 Card Spotlight: Acidic Swamp Ooze The high level metagame (which filters down to those of us in the bowels of the ladder) consists of several important decks that utilize weapons and/or attacks with the hero. 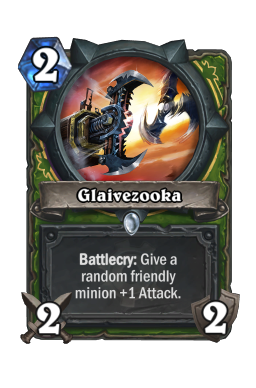 Even though it looks like one of those blind dates your dad told you about, the Ooze is a perfect fit for the current metagame. 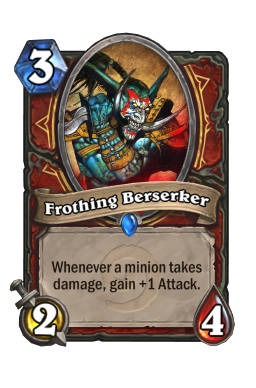 For instance, it can dissolve Death's Bite before the Warrior player has set up his Warsong Commander , Grim Patron and Frothing Berserker combo; an important play. 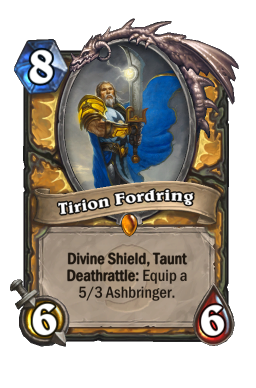 Because a passable Patron Warrior deck is about as hard to collect as sand on a beach for anyone who has paid for Curse of Naxxramas and Blackrock Mountain, the accursed thing is everywhere. The players at rank 18 don't know how it works, but that won't stop it doing amazing things every now and again; usually against you when you think you've won. Worse yet, as an involuntary response everyone else has been struck with a wretched bout of the Handlocks just when we thought we had a stable vaccine. 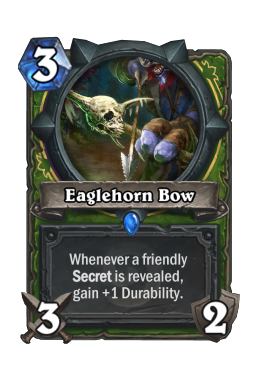 In terms of weapons, Mid-range Hunter decks are common as well and they rely mainly on Eaglehorn Bow , while Face Hunters run Glaivezooka in addition. And then there is the endless stream of Poisoned and Oiled Wicked Knives in the hands of the average Rogue. With the Mighty Ooze at your side, the best laid schemes of these mice gang aft agley. 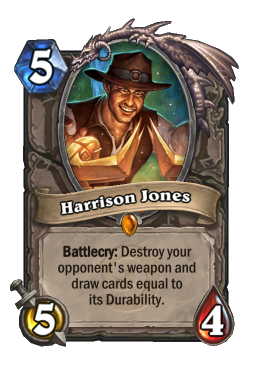 If you've managed to score a Harrison Jones so much the better! When to remove Acidic Swamp Ooze? Never. Or at least not now, anyway. 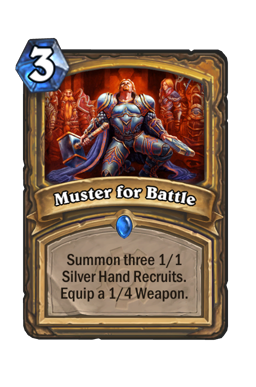 Easier Laddering Games are getting a little easier now, and we should be looking to move up the ladder even if our decks haven't improved. At the start of each season every single player devolves to rank 15 at best; business and party together in Hearthstone's revival of the mullet. But now the field is gradually spreading out. 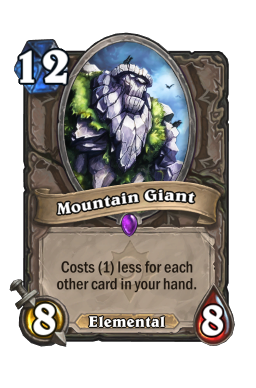 The players with the stronger decks and collections are tending towards legend, giving us more time to compete against others with similar strength collections. Why, only the other day I lost a ranked game against someone who was playing the stock-standard Basic deck for his hero. In the words of Hagrid: "I should not have said that". 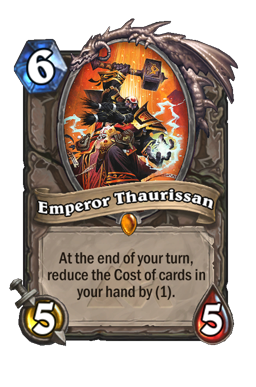 I've seen a significant drop in the numbers of Sludge Belcher s and Mountain Giant s at rank 14-18, but no fewer Grim Patron s or Emperor Thaurissan s. What this means is that the players playing decks generally requiring greater skill have moved upwards out of reach, while those with more money than skill remain. 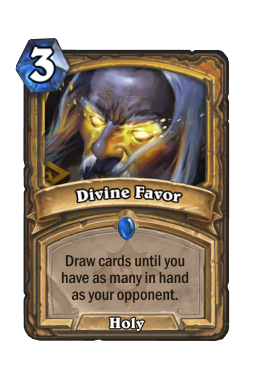 Even though my decks weigh in at a fraction of the dust cost of those of my opponents I feel I have an excellent chance of a win most of the time because my opponents generally lack experience with their decks or their chosen hero, and therefore will make mistakes that devalue their board. But it's not all roses - their better cards are better with reason! It's simply worth remembering that the best time to climb the ladder is later in the season when you can get the win streaks that drive you rapidly upward, and provide a more accurate reflection of your level. So how have the three decks I presented last time progressed? 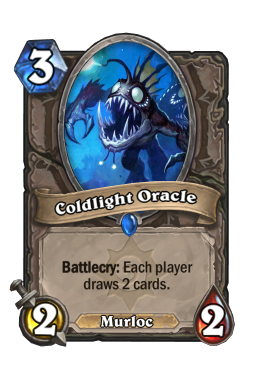 I opened the following useful cards from quests this week: Wrath , 2 Loot Hoarder (same pack), Mountain Giant , Worgen Infiltrator , Bite , 2 Explosive Shot and one of my perennial favourites, Coldlight Oracle . 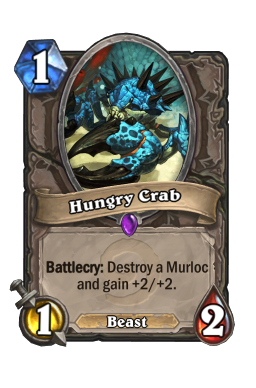 I also opened a Hungry Crab which puts me 100 dust closer to crafting that first Legendary. 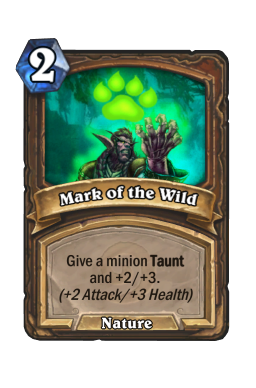 My Druid deck snapped up the Wrath and Bite - significantly better than the dreadful Mark of The Wild . 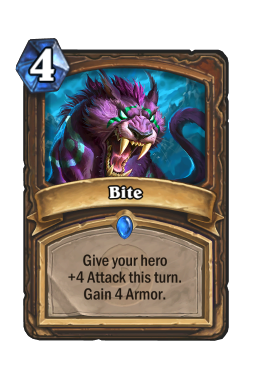 I don't particularly rate Bite, but it does a job and my Druid deck needs some help. 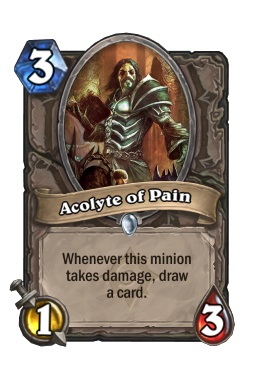 My Priest and Mage decks both had a good look at the pair of Loot Hoarders, but for now have stuck with their initial build and plan thanks to a pair of the slightly stronger Acolyte of Pain . The Mage deck is 7-3 in ranked play this week, while Priest went 2-0, both decks played on the cusp of ranks 17 and 16. 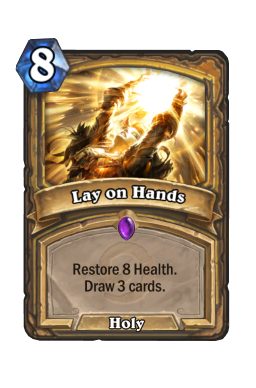 After wrecking everything in sight with two of the new decks below, my Priest returned to the fray at level 15, and promptly went 5-1 (the loss being a dreadful game where I drew 1 minion prior to turn 9). Build-a-monster might be better than I thought; even zetalot is playing it now. I tried the Druid at rank 14, and oh dear! Back to the drawing board with that one! Hopefully I'll have a better deck next week. 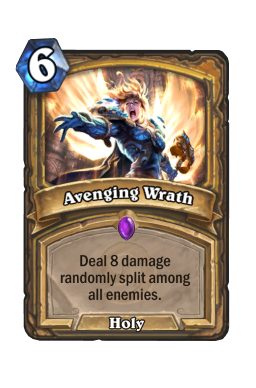 And then just when you tell everyone you're not going to use any Legendary minions... Yeah, that's what I said as well. I always hover the mouse over each card back to see the glow that tells me the rarity of the card. I do this so I can flip over the lower rarity cards first, increasing the excitement like a kid saving the bigger presents for last. Obviously when I saw the second golden glow I didn't think "Oh! Wow!" I thought "Is there a third?" We humans are such greedy animals. 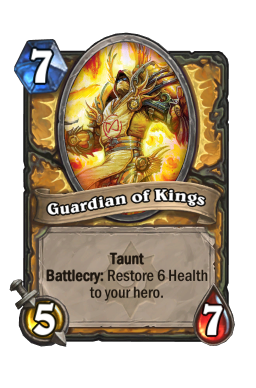 That pack means that in the 5 weeks since I started this US account I have opened as many Legendary minions as I have on my EU account in the 7-8 months that I've been an active player. It's not just the fact that I have 5 Legendaries either; their quality is staggering. 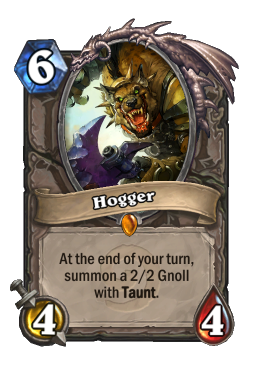 Both class Legendaries and Ragnaros the Firelord are first rate, while Hogger is a solid card in decks lacking greater power - in fact, just about the perfect card for an FTPer. 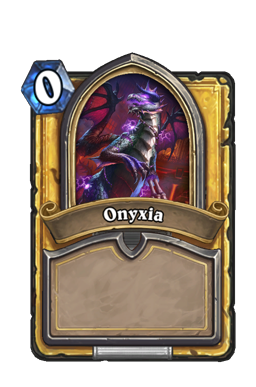 While I don't rate my 5th Legendary overmuch, Onyxia is still a Dragon and therefore Brian Kibler is surely losing sleep about being unable to find a suitable home for it. This is the same count as the number of Epic cards I have opened, and there is only one dud among those as well. So what are the chances of you having similar luck? 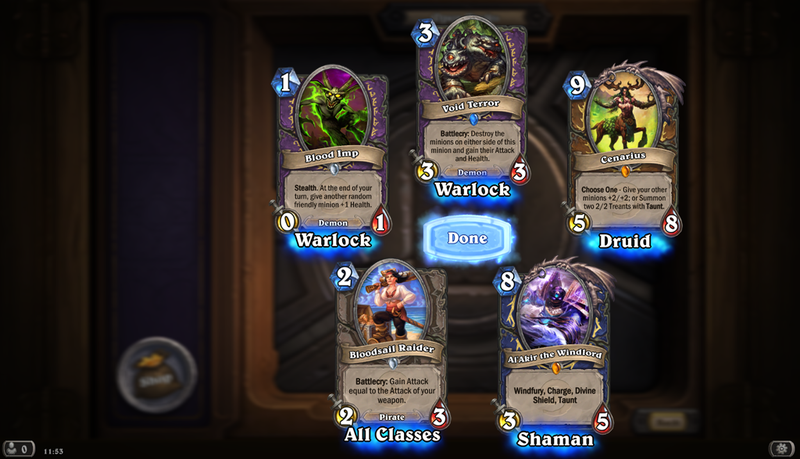 Not great, I'm afraid.... One should get a Legendary card on average every 20th pack opened. 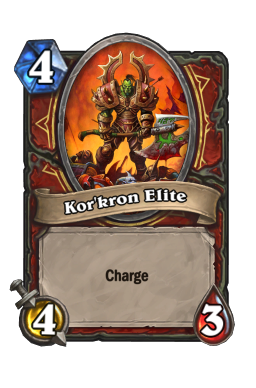 Epics are 1 in 5 packs, while packs with more than one rare come up 1 in 4. 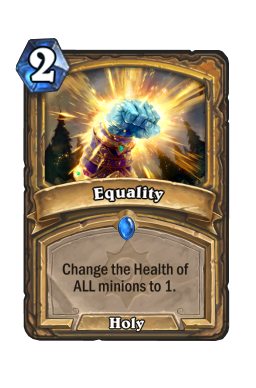 Naturally there is a chance that the higher rarity card(s) in the pack replace the normal rare slot, but I've only had that happen once [balanced by opening 1 pack with 3 rares in it]. A quick count reveals I have opened 26 packs. Although my rate of Epics is right, 5 Legendary as well somewhat defies belief. My buddy tells me I should start this article series again with a new account on the Asian server; "this collection is totally unfair". This week's decks revolve primarily around a deck-building concept called "Tempo", so I feel it appropriate to discuss that first. 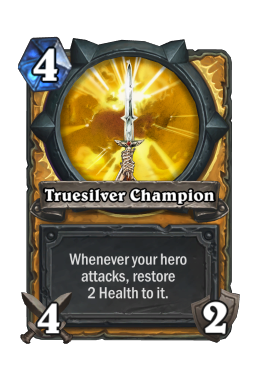 Tempo also happens to form the cornerstone of good Arena decks, so understanding this type of deck will stand you in good stead when you start to play Arena more frequently. The primary purpose of Tempo is to gain the initiative and maintain it long enough to win; keep tying the bully's shoelaces together and eventually he'll fall on his face. Having the initiative means that you are the player making the choices while your opponent is the player reacting to the situation on the board. 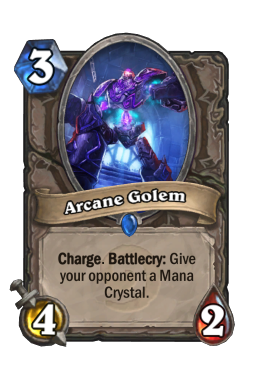 The Tempo player will aim to use all his mana crystals effectively each turn, creating plays for the opponent that force him to lose efficiency or actual cards in order to maintain the status quo. 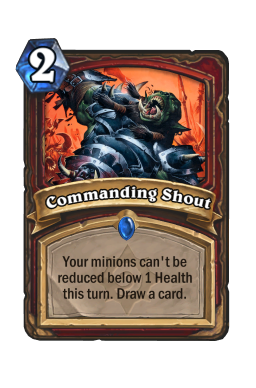 This strategy is not to be confused with Aggro decks which largely ignore the board and try to reduce the opponent's life total to zero without regard for resources, with the understanding that if they ever fall behind they cannot win outside sheer good fortune. Sap is the Tempo poster-child. 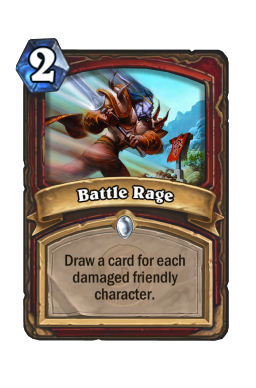 For 2 mana the Rogue removes from the board a card generally more expensive to cast, in order to retain an advantage in time and development. 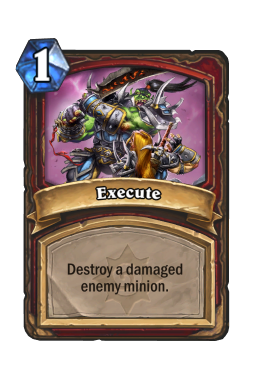 The low cost allows the Rogue to also play another threat (or remove a second minion, especially with the Combo mechanic) if needed. The opposing player is generally obliged to replay his threat the following turn, wasting yet more time and therefore remaining behind. 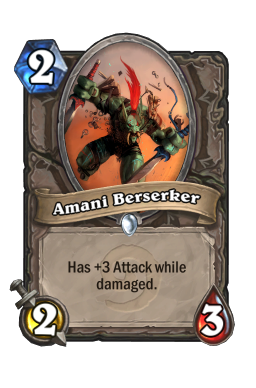 Even though the Rogue player didn't directly kill whatever was bounced, for a mere 2 mana he gained an entire turn. 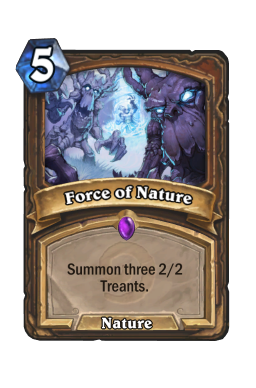 To play Tempo the deck must necessarily be built along a solid "curve" of casting costs. 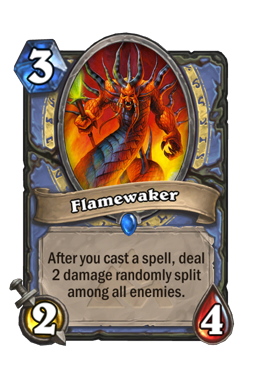 The closer this curve resembles the Bell Curve we all know and love from school examinations, the better; the peak should be at 4 mana. 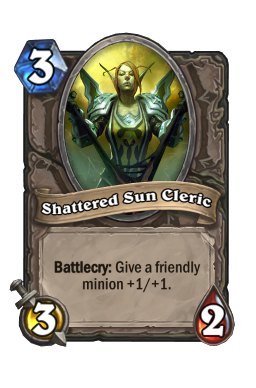 This is so one may play strong minions during each of the opening turns, placing the opponent under immediate pressure. 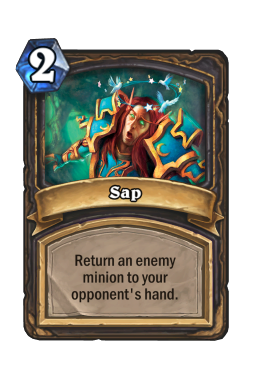 Once the opponent is in a state of only reacting to the board, you press the advantage of being able to decide how to make trades in combat, generally "trading up" (using smaller and/or cheaper minions to kill more expensive ones) or otherwise disrupting the opponent's next turn (for example, forcing him to use his hero power when he doesn't want to, costing him 2 mana and forcing him to play a cheaper spell than the ideal as a result). Keep on curve, keep him off curve. 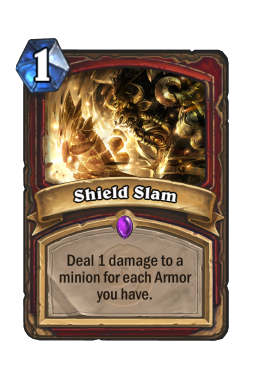 Do it often enough and for long enough, and the opponent will run out of health despite a handful of cards that he's simply been unable to play in time. 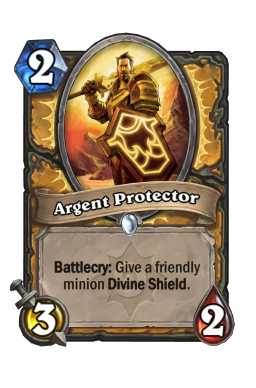 The standard mulligan strategy for the Tempo player is to discard the entire hand if it does not contain a "2-drop" (a minion costing 2 that can be played on the second turn - Shielded Minibot is a 2-drop, but Argent Protector technically is not as its ability is wasted while one has no minions in play). 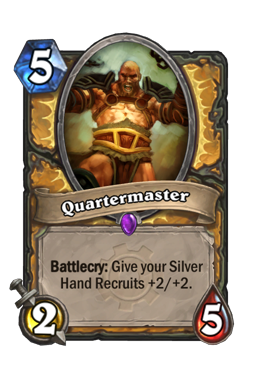 The perfect opening hand contains minions costing 2, 3, and 4 mana, and one draws into some form of threat removal immediately. 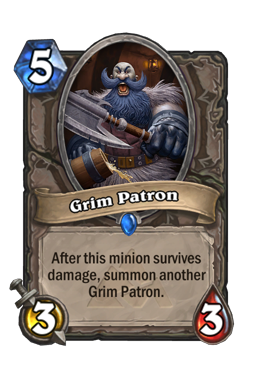 Naturally the Tempo deck has to use these generally cheaper minions as a way of creating time and occasionally card advantage - throwing together some imps and hoping they lay off the booze in the absence of a supervisor isn't going to cut it. 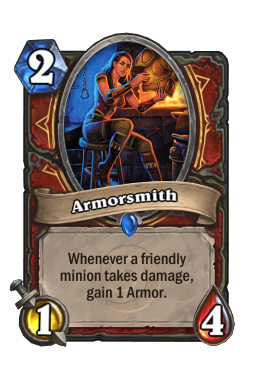 Minions with only 1 health or a lower attack than health generally won't fit the bill, as they will either die too easily or will not trade up effectively. 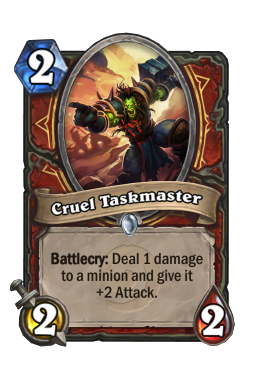 So in fact the 2-drops can't just cost 2 and have no "entry requirements" - they also have to actually be good. 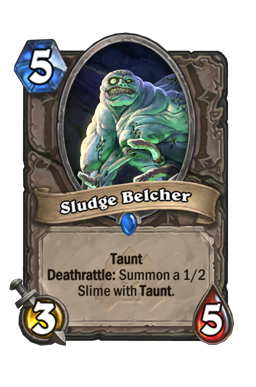 In the suite of 2-drops with 3/2 bodies one quickly runs out of options outside Acidic Swamp Ooze that aren't "vanilla" or rare (or better). 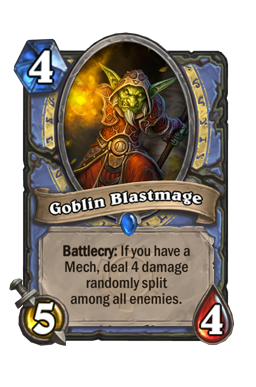 Mad Bomber is perhaps the most infuriating of the bunch. 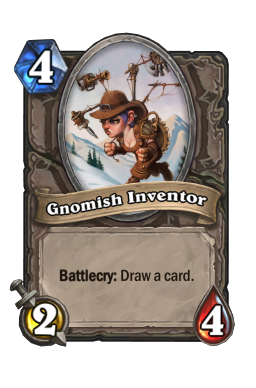 It looks a completely decent card until you realize he fails to toss his barrels across the halfway line as often as stoners have the munchies. 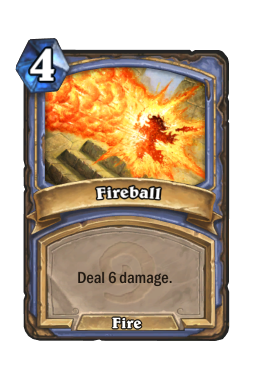 Sometimes you wish he'd throw a barrel at everyone and then just DIE; but Blizzard made Arcane Explosion for that. 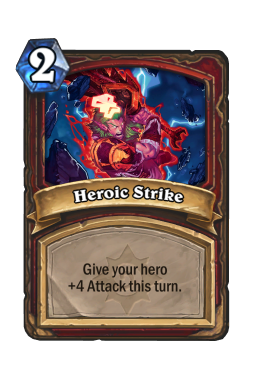 Core: Although not a card, the core of any good Hunter deck is the hero power. 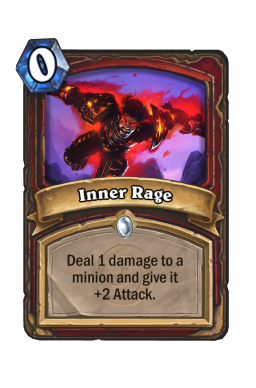 Nothing says "aggro" quite like an ability that can only target the opposing player, so I find it amazing that people think Hunter cards should aim to control the board rather than put further pressure on the player. In truth, Hunters are as subtle as a restraining order, so don't be afraid to go face every turn; your opponent plays this game because he or she loves the challenge, remember? 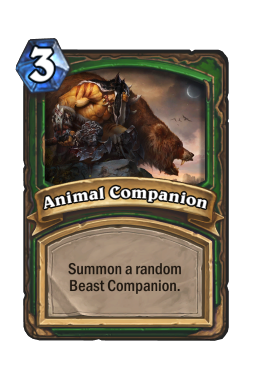 You can't leave Animal Companion or Kill Command in your card file - you want these Golden as soon as possible. Apart from that just about anything goes, especially if it happens to be a beast. 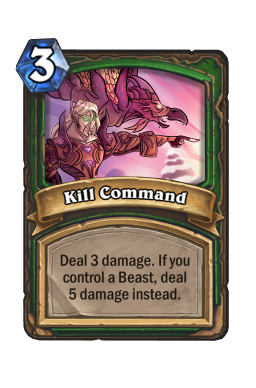 Blizzard have nerfed so many Hunter cards I've lost count, and the deck still won't die because removing Aggro from the environment would not only kill the game it would kill FTP. Last time I checked they weren't keen on doing either of those things. 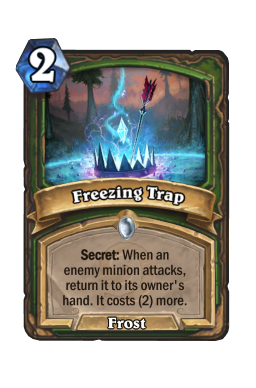 Strategy: Unfortunately the real stars of serious Hunter decks are non-basic: Explosive Trap and Freezing Trap can change the feel of the deck between aggressive or control, while Eaglehorn Bow is as vital as checking your email. 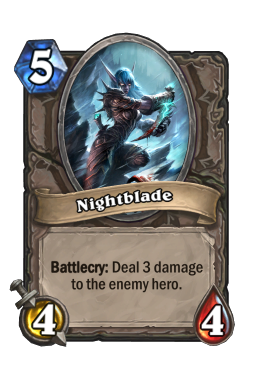 The more Knife Juggler s and Unleash the Hounds you play on the same turn the better! But without those tools we're largely struck with the usual suspects: Bloodfen Raptor , Shattered Sun Cleric , Chillwind Yeti etc. In the early phases of development we have to follow the Tempo route with Hunter, but we get a helping hand from the hero power which you should use as often as you can; every point of damage counts. 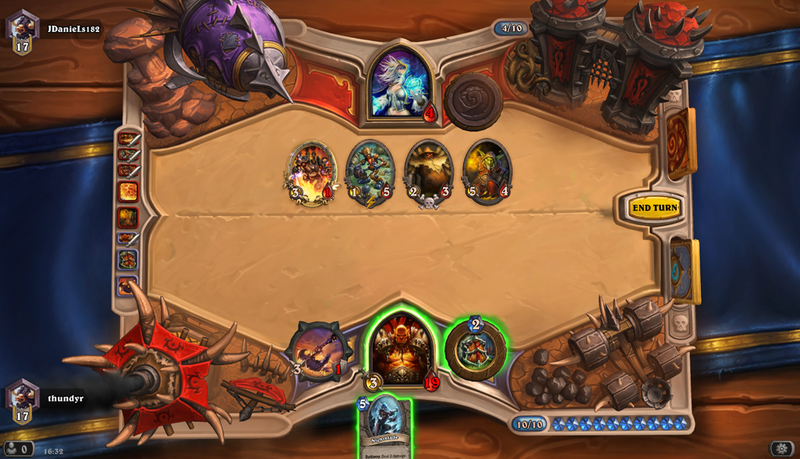 Progression: Given that I have an Arcane Golem I tried to force the aggro "Face Hunter" route too early. 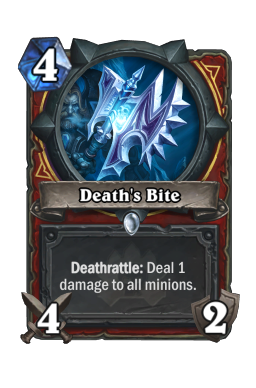 This was as big a mistake as I made with my Warrior deck above before I dumped the bad 1 cost minions in favour of a better curve. In the end I settled for something with a solid mid-game and a full frontal assault finish. Comfortably my most expensive deck in terms of dust cost, this one finally began to show off the strength of the hero power, going 4-2 on the cusp of ranks 16 and 17. I must admit to being somewhat disappointed with it; I know I can build a better deck than this barely adequate effort.